Craving Spanish food but don't know where to start? These staple ingredients should make your choice that much more simple. Graphic designer Christine Rode created What Food Looks Like for a class at California College of Arts for eight different types of cuisines, after realizing most of her peers relied on take-out and frozen meals instead of picking up fresh produce. "I set out to make a photographic diagram of what your meals look like before they’re prepared," Rode explained on her website. The eight tablescapes show the key ingredients found in each type of cuisine. 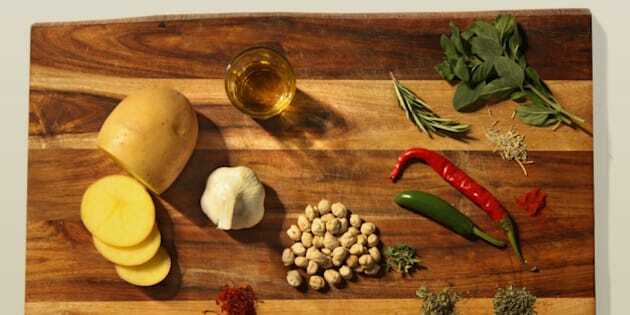 From fresh herbs to simple starches, the boards take you back to basics and explain how the ingredients work together. Travelling between the different platters, you get a snapshot of what it takes to make traditional meals, and in some cases, you even see which countries' cuisines have inspired others. But if you're just looking for flavour ideas, you can simplify it further. The Daily Mail reports you only need three ingredients to produce the flavours of 36 world cuisines with garlic dominating across Europe and Asia. So instead of swinging by the drive-thru, take a look at the slideshow below and see what real food looks like. While French cuisine is quite varied leeks, shallots, onions, butter and herbs are staples for standard fare. Though Italian cuisine is considered a staple, it is heavily influenced itself. Drawing from Greek and Arab influences, Italian staples include garlic, oregano, olive oil, tomatoes, pasta and parmesan. Heartier foods are required for hard Scandinavian winters so, naturally, potatoes, carrots, onions, herbs and salmon are staples. Spanish cuisine is dependent on climate and culture. Fresh ingredients like peppers, herbs and olive oil are paired with filling potatoes and chickpeas. One of the most varied cuisines, Mexican food draws on Spanish staples and adds spice, rice, beans and corn. Known for their tasty vegetarian dishes Indian entrees rely heavily on spices, lentils, rice, garlic and oil. Arguably the most famous cuisine, Chinese dishes balance taste, texture, colour and aroma. Beginning with a simple base of rice, ginger, soy, noodles and bok choy, the possibilities are endless. Known for being light but spicy, Thai food incorporates a balance of sweet, salty, sour and bitter. Try cooking with eggplant, fish sauce, noodles or rice, lemongrass, cilantro and chili for traditional Thai flavour.